Recently, I’ve been playing Stardew Valley a lot. It’s a charming retro game, featuring a young hero who shuns being a corporate slave, trading it for a new life on his grandfather’s farm. But it’s not just about growing crops and tending animals; there’s a little bit of adventuring on the side, and the entire game is overlaid with this social aspect of helping the townsfolk and rejuvenating the village. 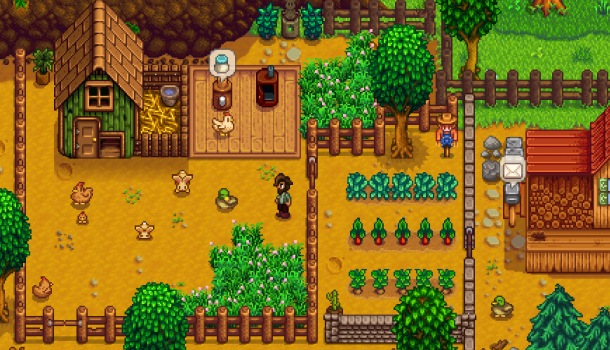 Part of the success of Stardew Valley is that it’s a stark contrast to what most of us are currently playing. The 8-bit art style and gameplay is evocative of Harvest Moon, a franchise that’s still yet to make it to PC, and uncorking a significant amount of bottled-up nostalgia. The slower pace also flies in the face of immediacy-driven or constant-trickle rewarding, with both crops and friendships taking time to nurture and grow. While Stardew Valley isn’t groundbreaking, it represents time well spent, which is all most of us are after at the pocket-money Steam price. That ‘of-the-moment’-ness is also evocative of a less favourable time in online gaming. With Mists of Pandaria, it seemed as though Blizzard were cramming in similar gameplay to World of Warcraft, where we’d get an old farm and start building it up. The concept was added to in Warlords of Draenor, as we got our own garrison of minions to do our bidding. It felt as if the studio was trying to offer two-speed gameplay – dunegoneering for immediate reward, alongside being an armour-plated middle manager for longer-term gains. Trouble is, what happens when those dungeons and raids start to feel old and stale, or no longer offer rewards? My own experience was a gradually shrinking gameplay session, where I’d log in, do stuff around my garrison, collect loot from my minions and send them out on missions again. It became a daily checklist – I wasn’t being a hero any more, but just a supervisor on the factory floor. That’s not an adventure, it’s a job. Just add in some commuting mini-game, and you’ve got a regular nine-to-five compressed to half an hour of mouse clicks. It also nuked the social aspect of online gaming. After all, why go to the big city when you have everything you need at home, all carefully optimised thanks to some guide you found? I didn’t see my gaming buddies any more. I no longer felt the need to stir things up in Stormwind. I didn’t randomly role-play any more. And, in the end, I stopped logging in. That, and the entirety of WoD felt like a self-indulgent diversion from the actual plot. Now, I’m not saying that Blizzard can’t learn from previous expansions. My experience with the Legion alpha so far is almost like comparing chalk and cheese, and I’m enjoying it immensely. The subtle move to class order halls is also interesting, as it means you’re more likely to bump into other players while going through your game session cycle. Those order halls will also have follower missions, and here’s where the cynicism creeps in. There’s a tremendous opposition to the existing WoD garrison format – of being a taskmaster rather than an adventurer – and it’s an opposition that I definitely share. In Legion, the word is that we’ll still send our followers on missions, but that we’ll also lead them on those adventures instead of sitting back at the ranch awaiting their return. That said, follower missions haven’t been added to the current alpha yet, so there’s an element of the unknown here. Anyhow, back to my point. When designing an MMO, there’s clearly a desire to look at other games that have high player adhesion and no real end-state. Management games like The Sims and Stardew Valley are one. Idle games like Adventure Capitalists are another. But if those games don’t gel with the core experience – of being the hero and going on epic adventures – then players are legitimately going to question why you’ve added them. And if those diversions start to replace those core experiences, so a player’s entire game cycle is taken up with non-core stuff, don’t be surprised if they go searching for heroic adventure elsewhere. I’m more confident than normal that Blizzard knows this, as there’s been a lot of talk about bringing out the various fantasies, and making the classes and specs feel more heroic and true to type. This focus on different ways in which players can be heroic is a great thing, and it’s something I hope has been osmosed into other design teams. Give us different viewpoints of the heroic fantasy, instead of trying to climb the corporate ladder at Adventure, Inc.
Stardew Valley is quite happy being Stardew Valley. WoW doesn’t need to be every game under the sun – it just needs to be great at playing out that fantasy of being a hero on an epic adventure with friends. Sounds simple, right? This entry was posted on Monday, March 7th, 2016 at 2:19 pm	and is filed under Warcraft. You can follow any responses to this entry through the RSS 2.0 feed. Both comments and pings are currently closed. Interesting tie-in between the design of Stardew Valley and the shortcomings of garrison’s. The similarities are one of those things that seem obvious when they’ve already been pointed out, but weren’t up until that point. I think that fundamentally, the MMO genre forgot about the idea of a core competency. WoW looked to other genres, other MMOs looked to WoW, and for a long time all we got was a variety of disjointed messes to play. The story du jour seems to be the “death of MMOs”, or, as more reasonable people are putting it, the genre shift to indie and crowdfunded development now that triple A producers have effectively pulled out of the market. It won’t help existing MMOs like World of Warcraft, but budgetary constraints alone are forcing these new games to focus on delivering a core experience and being good at it – they can no longer afford to develop everything at once. This is a good thing, I think. I suppose only time will tell.